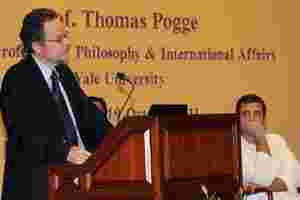 Rahul Gandhi (R) listens to Thomas Pogge. PTI. New Delhi: India, Brazil and South Africa should take a leadership role to protect the rights of the poor in the world by weighing in more heavily when it comes to defining the rules governing international institutions, said leading political philosopher Thomas Pogge. Pogge, the Leitner professor of philosophy and international affairs at Yale University, said on Wednesday that inequalities in the world were rising rapidly as a result of globalisation. A small percentage of the rich and influential are able to frame rules at the expense of the poor, he said. In his speech titled “Globalisation, justice and rights," Pogge said that about 18 million people were dying prematurely every year because of poverty-related causes. “This catastrophe is much larger than the government inflicted violence" for instance, during the second World War. Linking ideas of justice and human rights to globalisation, Pogge said generally it was thought that the onus of respecting human rights rested with governments and armies. But violations, or lack of human rights, can also apply to institutions, he said, adding that the rules imposed or the action taken by large international organisations and supranational institutions could impact the rights of people. “Human rights can be better fulfilled or worse fulfilled by the way rules are framed," he said. As the world’s largest democracy, “India is particularly well positioned to see that the interests of the poor are taken care off" in the international fora. India, along with Brazil and South Africa, should assume a leadership role in “defining international rules governing large corporations and banks," he said. India could be a model for emerging countries showing how prosperity and eradication of poverty can go hand in hand within a democratic framework, unlike China where people had to choose between the two, Pogge said. In his remarks, trustee of the Rajiv Gandhi Foundation and Congress leader Rahul Gandhi said the vote was the most basic instrument of empowerment and justice in India. “What does it imply for us as a just nation when we cannot guarantee a migrant seamless access to franchise? The same problem also suggests where the solutions lie—in innovations such as the unique identity, which allows us to know and therefore guarantee a voice to every individual," Gandhi said. The unique identity project, launched in 2009, aims to give every Indian an identity number. So far, 50.1 million people have been enrolled under the programme, which targets giving unique identities to 600 million people by 2014.